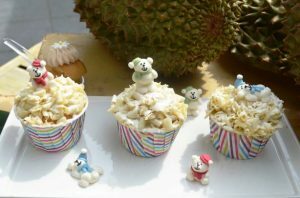 Durian lovers, you can have your fruit and eat durian in many ways! 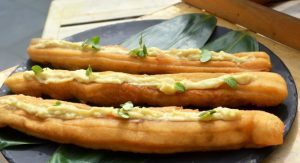 Chefs from Le Méridien Singapore, Sentosa share recipes on making various durian creations and tips on cooking with durian, so you can enjoy these tasty treats fresh from your home. Split the pair of dough sticks and cut into desired portions. Slit the dough stick into half, about halfway through the depth. Fill the dough stick with the durian paste and repeat this step till all doughsticks are filled. Sprinkle some white sesame seeds on top of the durian paste filling. Heat up some cooking oil in the pan and place it down on the side with the filling first. Shallow-fry the dough stick till golden brown. Fry the dough stick till it is golden brown on both sides, drain the oil and cut the dough stick into bite-sized portions for serving. Pour 1.5 cups of warm water into a large bowl. Sprinkle the yeast and let it stand till foamy for about 5 minutes. Whisk sugar, oil and salt into the yeast mixture. Add flour and stir till a sticky dough forms. Transfer dough to an oiled bowl and brush top with oil. Cover bowl with plastic wrap and set aside in a warm place until dough has doubled in bulk, for about 1 hour. Mash the durian paste and remove any hard particles. Spread the durian paste on the pizza crust and add mozzarella cheese generously. Bake at 200°C for 12 minutes until pizza is browned on the top. Preheat the oven to 150°C. Place four ramekins in a deep-roasting pan or baking dish. Pour the cream, milk and durian puree into a large saucepan, and heat the mixture on medium heat till just below boiling point. Once small boiling bubbles start to appear on the surface, immediately turn off the heat. Whisk the egg yolks, salt and caster sugar together gently. Slowly pour the hot cream mixture into the egg yolks, while whisking the whole time to prevent scrambling. Divide the mixture evenly between the ramekins, then pour sufficient warm water into the roasting tin or baking dish till halfway up the sides of the ramekins. If there are any small bubbles on top of the mixture, lightly run the flame of the blowtorch over the ramekins. Bake for 30-40 minutes till it just sets. The creme brulees should still wobble slightly in the centre. Remove the creme brulees from the water and allow to cool, then transfer to the fridge to chill. Before serving, top each creme brulee with a tablespoon of caster sugar. Swirl the sugar around to even out the layer on top of each creme brulee. Use a blowtorch to heat the sugary tops till they are golden brown and caramelised. 1. Combine all ingredients in a pot. 2. Simmer over low heat for 1.5 hours, stirring occasionally to prevent the mixture from sticking to the bottom of the pot. 3. Remove pandan leaves, cool, chill and serve. This will keep up to a week in the chiller. 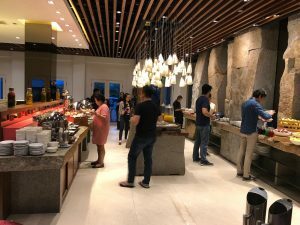 From 6 July – 1 September 2018, Le Méridien Singapore, Sentosa will be holding Sentosa’s first durian buffet. 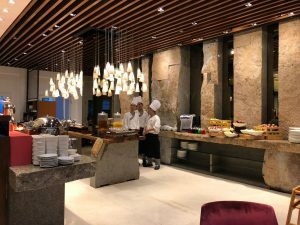 At the Du-licious Discovery Durian Buffet, diners can enjoy unlimited durians such as Mao Shan Wang, Red Prawn, D24 and XO from the durian pop-up stall, as well as durian desserts which are added onto their long-running Taste of Discovery Buffet. 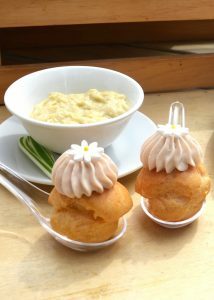 Their durian creations run the gamut from durian ice kachang, durian chendol, durian pengat, durian choux puffs, durian cupcakes, to even durian prata and durian green bean soup!